Hot on the heels of their 2010 album "Secret Weapon", The Qualia are back with a brand new release, just in time for summer. On the six tracks of their new EP Memorial Gore, the Brooklyn, NY electro-pop four-piece rips through a wide swath of musical territory, from high energy disco-pop to torn-apart country balladry. Each song is a puzzle, with hidden stories about frustrated agoraphobic novelists, traumatic childhood accidents, and drug-addled adult siblings nestled within infectious, catchy-as-hell hook-laden synthpop songs. 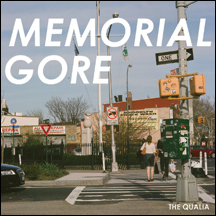 Like the best of The Qualia's work, the songs on Memorial Gore initially show themselves as immensely accessible pop confections, but that first reaction soon gives way to a haunting, surprisingly dark interpretation of the burdens of modern living. Just as with the band's previous two releases, Memorial Gore was written and produced by principal songwriter and multi-instrumentalist Lars Casteen, but this EP shows the band functioning more as a cohesive whole, with Chvad SB (synths), Rossen Nedelchev (drums / programming), and Zakai Robbins (bass / vocals) lending the songs an energy and passion that are largely unheard in the often detached world of electronic pop music. This is the perfect entry point for an inventive and talented band, and is only a taste of things to come. Fans of Cut Copy, Junior Boys, and Lyle Lovett will find a lot to like.